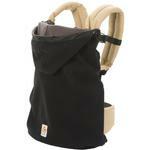 ERGObaby - Standard baby carriers - Free Shipping! 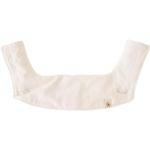 ERGObaby is a family owned and operated company located on Maui, Hawaii. Their mission is to offer parents the most thoughtful, highest quality, and most innovative babywearing products and accessories found on the market. It is their goal to educate parents about the baby wearing lifestyle, attachment parenting and related topics to improve the way our next generations of babies are introduced into the world. More .. The first-in-line design that made our name, now in it’s third-generation, the Ergobaby Original Carrier has evolved to make it more comfortable than ever. Made of durable cotton canvas with high-density padding and straps that adjust for the perfect mutual fit. It is available in a variety of popular colors and as with all Ergobaby carriers, it keeps baby safe, close, and comfortable while providing you freedom of movement. 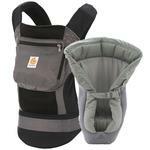 ERGObaby is thrilled to announce the newest addition to the Performance line of baby carriers! Made of durable, lightweight, and breathable fabric, this rugged yet lightweight carrier is a favorite of active moms and dads. Features include high-performance polyester exterior in bright Blue, ideal for outdoor activities in all climates; a breathable Black mesh lining, keeping babies and parents cooler and more comfortable. 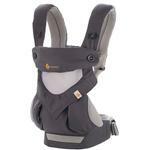 This kit includes the Ergo Baby Charcoal Black and Grey Infant Insert. ADAPT baby carrier offers Ergobaby’s renowned comfort and ergonomics in an easy-to-use 3 position carrier that adapts to your growing baby from newborn to toddler (7-45 lbs), no infant insert needed. Our all-in-one, newborn ready Omni 360 has all the carry positions you need. The Omni 360 grows with your baby from week 1 to 36 months. You can have it all in this carrier. Conquer the cold in style with this designer carrier combination. 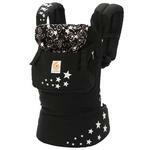 The Four Position 360 Baby Carrier provides four comfortable and ergonomic ways to wear baby: Front-Inward, Front-Outward, Hip and Back carry positions. 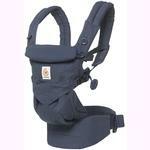 he Ergobaby Four Position 360 Cool Air Carrier in Carbon Grey, made with 3D Air Mesh fabric to keep baby cooler longer. 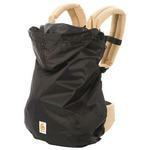 Offering four carry positions, including our ergonomic forward facing option. A key rule of parenting is to always be prepared. Ergobaby's new and improved Winter Weather Cover easily attaches to any Ergobaby Carrier and is designed to beat the elements. The Winter Weather Cover has a water-resistant, ripstop fabric shell to protect baby from rain and snow and a soft fleece lining to keep baby cozy and warm in cold weather. Winter can't stop you and your baby now. One of the greatest gifts anyone can be given is the opportunity to be a parent. I remember when my son was only a few days old, sound asleep in his bassinet; my strong desire to pick him up and hold him close to my heart dominated any other need. My mothering instinct to keep him safe, secure and content has always been my driving force, and when I started ERGObaby, my intention was to create a product line that would promote and enhance the ability of parents to safely and comfortably keep their babies close to them as often as possible. Eight years later, my research into the science behind babywearing has affirmed my mothering instincts. I know, beyond a doubt, that bonding with and nurturing our babies from infancy with the help of babywearing is absolutely the best way. Hundreds of thousands of happy babies around the world are riding close to their parent?s heart in The ERGObaby Carrier, in much the same way that indigenous cultures have for thousands of years. Whether it is a soft-structured carrier, wrap or sling, babywearing has always made it safe and easy for mothers to stay productive while tending to the needs of their babies. As a part of our commitment to the safety of the children entrusted to our products, the ERGObaby Carrier has gone through rigorous safety testing and has been certified by the European testing agency TÜV since 2008, and by the Juvenile Products Manufactures Association (JPMA), according to the American Standards for Testing Materials (ASTM), since 2008, and, most recently, has met all the CPSIA (Consumer Product Safety Information Act) standards mandated by Congress in 2008. ERGObaby's Doll Carrier bears this internationally-recognized seal, which ensures that a children's product has met all safety requirements. The safety criteria cover general risks (protection against health hazards or physical injury) and particular risks (physical and mechanical, flammability, chemical properties, electrical properties, hygiene, radioactivity). The Juvenile Products Manufacturers Association, Inc. is a national trade organization representing 95% of the $7.3 billion industry. It was formed in 1962 and has grown to include 250 companies in the United States, Canada and Mexico. JPMA developed an extensive, unique Certification Program that has been guiding parents and caregivers for 25 years toward purchasing juvenile products that are built with safety in mind. Parents can look for their seal on product packaging. To become JPMA certified, a product must be tested by an independent testing facility for compliance with the specific ASTM (American Society for Testing & Materials) standards. If a product passes the tests, JPMA allows the manufacturer to label it with the JPMA Certified Seal. The ASTM developed and published the standards. JPMA and industry members, consumer groups and staff from the US Consumer Product Safety Commission were involved in the development of the standards. The ERGO Baby Carrier and related ERGObaby products fully comply with all of the requirements and limitations of the CPSIA, and undergo regular testing to insure that our products meet or exceed all applicable government regulations and industry standards to insure the safety of our customers and the children entrusted to us. Hello, I am the President and Designer of the ERGO Baby Carrier. I thought you might like to know a little about myself and what got me to this point. I come from a truly integrated Danish background. My mother is Danish and my father?s parents were both from Denmark. My family life was all about travel. Between ages 4-6 we lived in Beirut, Lebanon and at the age of 16 I had been to Denmark 13 times, sometimes for a month over Christmas to living several years at a time. I absolutely love the Danish sense of style and design. I lived in France for two years studying the language and culture through a university exchange program and at La Universite de la Sorbonne in Paris . I graduated from the University of Minnesota in 1984 with a BA in French and Danish. Then I lived in Germany for a year and half working as a translator for a German Architect. I used to sit in my office starring out the window dreaming about designing clothes. Because my creative juices longed to be inspired, I returned to the University of Minnesota and graduated in 1988 with an MA in Design from the Department of Design and Apparel. After graduation I designed and created several Limited Edition lines of clothing and produced many high-end commission pieces. I worked three years for a small woman?s clothing manufacturer as their main designer and production manager. Some of the lines I developed under my own label were: Karina, EKKO, Design Karin Frost, and Pacific Mythics. Another passion of mine throughout my life has been my love for the outdoors. I have been on many extended canoe trips and enjoyed that form of connection to nature but when I moved to Lake Michigan sea kayaking was much more condusive to playing on the big open waters. I followed this passion and became a Certified Sea Kayak instructor and enjoyed giving individual and group instruction. I started a Sea Kayak Center in Door County, Wisconsin and led sea kayak trips in Lake Michigan, Lake Superior and Yucatan, Mexico. My continued travels lead me to Maui, Hawaii where the incredible diversity of people living on a volcano in the middle of the ocean inspired both my love for nature and international background. Somehow I instinctively knew this was the place I wanted to raise a child. I met my husband two years after moving to Maui and our son, Keala Kaj was born a year later. I was 41 years old when he was born in our bathtub at home. My husband and I read the book, The Continuum Concept by Jean Leidloff, when I was pregnant and were so inspired by the concept that we integrated much of it into our parenting style. I was convinced that carrying my baby was the best way to usher him into our world. I tried many different carrying devices?front packs, other slings, and backpacks. Some of them worked fairly well and yet each had its problems. So with my design background it came natural for me to create a carrier that incorporates the elements necessary to carry my son for prolonged periods as his weight increased. As I began to develop the design, local parents would see me carrying my son and ask me to make them a carrier. They in turn gave me feedback as I continued to develop the design. 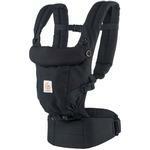 Ultimately, the result is the ergonomically sensitive design I call the ERGO Baby Carrier. It is a carrier that allows parents to keep babies close to their bodies and still have the flexibility of motion and use that so many of my parenting peers were seeking. I was delighted that I could easily carry my son as I did housework, nursed, gardened, shopped, hiked or danced! And he loved being so close to me. My son is four years old now and although I miss those tender moments of feeling him attached to my body during my daily activities (he still likes an occasional ride), it is wonderful to watch his emerging independence. I trust that our early bonding will strengthen his sense of security throughout his life. I can literally say that The ERGO Baby Carrier changed my family?s life. It has developed into a product and business that allows me to spend quality time with my son and it gives me deep satisfaction in knowing I have created a baby carrier that has brought so much pleasure to so many other parents and children around the world.